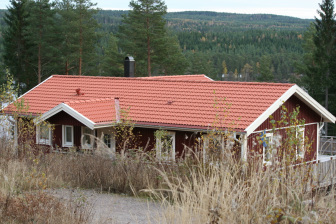 The House is situated on a large plot (2500m2) own ground where you can park your car. The surface of the house is approximately 125 m2, excluding the spacious veranda on 3 sides around the House. The house is suitable for 6 to 8 people. Entrance: Hall with toilet and storage cabinet. Spacious, bright living room of about 57 m 2. Modern and comfortably furnished with two (single sofa) beds, wood stove (wood is available), spacious dinette suitable for 8 persons, Radio/CD player, colour TV with DVD player and satellite connection. Two doors to terrace. A fully equipped open kitchen with dishwasher, oven, microwave, electric hob, kettle and coffee maker. 3 bedrooms, two with 2 single beds of 90 x 200cm and a hang/closet/kabinet. The parent-bedroom has a double bed (180 x 200cm) and a cabinet of 2 meters. For all beds have duvets and pillows, pillow-top mattresses for sofa beds also available for extra comfort. You must ensure yourself for bed linen and kitchen towels. Bathroom with shower, double sink, and adjacent sauna. Washer and dryer in the bathroom. Very spacious wooden terrace (plm. 100 m 2) equipped with outdoor furniture with cushions. The house is equipped with electric radiators with thermostat. Near the house two canoes are available including lifejackets (for large and small) and paddles.